Independent contracting is full of both freedom and uncertainty. While it may not be for everyone, it can offer perks that other roles can't compete with. Truthfully, being an independent contractor was something I excluded from my job search for a while as a new grad, but after living in a condensed area with several occupational therapy (OT) schools, I opened my search up to contractor opportunities with apprehension. I was always told working as a contractor was not a good new grads, let alone working as one in a school setting. I took the leap into the world of independent contracting to gain experience and earn a paycheck. And I live to tell the tale! It's not as scary as it may seem, and there are many opportunities out there! As with any job, there will obstacles, but we are OTs! We get creative and solve problems! Here are some pros and cons of independent contracting as well as some options for solving some of the possible problems! Flexibility is key as an independent contractor! Although I work in a school and the students are available from 9:00-2:30, I can see my students anytime in between! If I have a meeting in the morning and need to move my schedule around, I can, so long as my students are seen according to their IEPs. This is a great plus if you love to travel! You don't need to request time off to take the day off. All you need to do is make sure your students are seen for the number of minutes outlined in their plan, even if you see them a day or two before or after. The flexibility of the position is also nice if you are looking to make an easy transition to “adulthood.” When making your own schedule, it’s not necessary to work 40 hours a week. As a contractor you can pick and choose which students you would like to add to your caseload. This is great for individuals who have other jobs or are looking to slowly transition into a career in pediatrics. I cannot tell you that any job will be entirely drama free, but being an independent contractor allows the work day to be as drama free as it can be. When walking in and out of a school building you are only responsible for your own work. Of course, there are consults with teachers, other therapists, and administrators, but your main concern is time spent with your patients. No dealing with meetings or other affairs that a permanent employee might encounter or the drama that may come with them. Walk in, treat, and walk out! Mental health is such an important concept, and as OTs we should have good mental health practices. Take your own advice. A healthy work-life balance is such an important aspect of transitioning from your time as a college student to being a new practitioner. As a salaried employee, it can be very easy to become engulfed in doing work outside of the office, but as an independent contractor, when you're at home, you’re not working! Sure, some paperwork can be completed outside of the office, but typically you can get paid for that extra work being done, and this is something to ask about when you start. My company calls it “indirect time.” This encourages independent contractors to be efficient and get work done at work, so when it comes time to go home, you can go home. The transition from student to practitioner is hard, and working to reduce your stress makes that transition that much easier. Contractors may not get paid on a regular, bi-weekly schedule. Make sure to ask about your pay periods when interviewing! You may be paid every week or only once per month, so consider this when thinking about bills, rent, and student loan payments! If you are only getting paid once per month, then you will need to come up with a plan to budget and save your money for expenses as well as indulgences. As well as saving for expenses, when working as a 1099 independent contractor, you also need to save for taxes. As an independent contractor, taxes are not removed from your paycheck. Therefore, if you work for 7 hours at $50 an hour, you will see exactly $350 on your pay stub for that day. However, when tax season rolls around you will need to pay both the employer and employee taxes. This equates to about 35% of your paycheck each month. Managing your finances is never easy, but it can be even crazier as an independent contractor. Check out our Personal Cash Flow Calculator to help you sort through it all! For example, you would save $122 of that $350 paycheck and keep the rest for yourself! Now this 35% is considered a conservative amount to save and could change depending on your income bracket. It might not hurt to speak to an accountant about how much you should be saving! 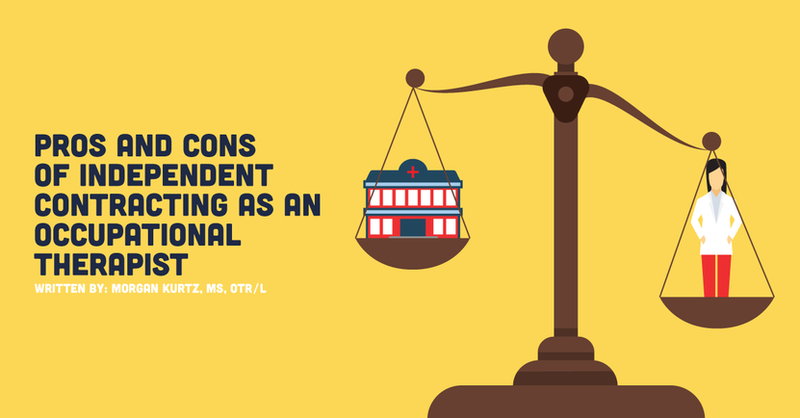 Medical benefits and retirement plans are not provided when you’re working as an independent contractor. Thankfully, if you are under the age of 26 and your parents have insurance plans, you can use theirs until then; the same goes for if you’re married and using your spouse’s insurance plan. Something to keep in mind though is that because benefits are not included, they also are not deducted from your paycheck, so you will see a little more money each month! It's not called “independent” contracting for nothing! I was lucky enough to have been placed in a school that has several other OTs and PTs who I can consult if need be. However, this is not always the case. It is very possible that you could be walking in and out of several school buildings a day and interacting with teachers and students but no other OTs. This might be a problem for new graduate OTs—and typically why professors and advisors suggest not doing this as a new grad—but keep reading for some tips on combating these jitters! Document everything! Label everything! Everyone has their own method, but organization is key when working as an independent contractor. You need to make sure to keep track of billing, treatment session notes, and expenses throughout your time as an independent contractor. Personally, I set up a flash drive and organized it into files such as “weekly schedules,” “billing excel sheets,” and “important documents.” If doing it electronically is not your forte, try colored folders for different subjects. Remember from earlier in the post when I said you might be on your own from day one? Well, this is where your confidence comes in. Walking into a new job, by yourself, on day one can be so difficult. And do you know the best way to combat nerves? Prepare! Go in a day or two ahead of time. Read the IEPs and review your students’ goals. Based on those goals, try to familiarize yourself with the therapy room and what tools you can use to reach that child’s goals. Although confidence is something that needs to be built, preparing as much as you can for day one will give you a boost! Although independent contracting companies do not typically provide benefits, this is one benefit you NEED to ask about! Looking for mentorship opportunities and having support from experienced therapists, along with getting resources from the company is so important. It’s especially important to new grads and those switching into an independent contractor position. Currently, my mentor works in the same building and same age group that I do–they’re able to provide amazing support and there is great correlation between our cases. Don't just ask about a mentor, ask about resources as well! Many companies can provide reference documents or continuing education classes! Create an Individual Retirement Account (IRA)! An IRA is a type of savings account that has the possibility (depending on which type you chose) to give you tax breaks for investing money in your future retirement. You add money to this account over time and invest in things (bonds, stocks, mutual funds, etc.) that can be withdrawn later in life for use in retirement! For more information on types of IRAs and next steps, check out this article. Health insurance is a MUST, and if you do not have it, you need to get it. Somewhere to look for insurance is the Healthcare Marketplace. This is a service that can help you find and enroll in affordable healthcare. Here is a piece from Healthcare.gov with some tips about the health insurance marketplace. This page includes information about open enrollment, not having coverage, paying based on your income, and how to apply! Explore this website to find several, extremely helpful articles about insurance and what to expect from the marketplace. I may only be a few weeks into my career as an independent contractor, but I have quickly learned that it’s not as scary as it sounds! Find a good company and begin an amazing career! Every job will present you with opportunities and obstacles, so whether you choose to be an independent contractor or an employee–be prepared. Either way, you’ll have to transition between student and practitioner. You just have to find the position that works for you.